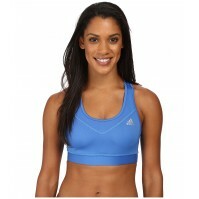 adidas Training apparel pays attention to the details so you can eliminate distractions and focus on your workout. TECHFIT aligns your muscles' energy to produce maximum explosiveness, speed and endurance. CLIMALITE fabric pulls moisture away from the skin and pushes it towards the outer fabric face for quick-drying comfort. This pullover design sports medium support and added shaping. Scoop neckline with feminine sweetheart outline. Racer back offers a wider range of motion. Brand mark logo sits at upper left chest. New elastic band is exposed yet smooth for a more comfortable and sleek fit. 70% recycled polyester 19% polyester, 11% spandex.Inner Lining: 87% polyester, 13% spandex.Mesh: 78% polyester, 22% spandex.